product catalog, order, and file management app. The only catalog, order, and file management app system for sales and marketing professionals that you’ll ever need. Sales reps have all of the most recent catalogs and files they need right where they can always find it. Marketers and managers rejoice! Showcase lets you distribute sales collateral in just a few clicks. Forget paper and dump the big screen. Professionally engage prospects with stunning visuals, all from your tablet. "I have worked with six of the Top 50 industrial distributors in the USA, and this is the best tool for field sales people and account managers that I have seen in a long, long time. Anyone who has a product to sell is a candidate to use the Showcase App. And it’s the best reason to finally convert to tablets. I invite you to try it." "Processing and submitting orders at night is a thing of the past now. The ordering process with Showcase is fast because access to all my sales information is in one app." "The system has been beneficial in selling potential customers on Real Flame. Much of our business is done online and through catalogs. Because of the remarkable screen resolution, Showcase allows us to accurately represent the quality of our lifestyle photography, which retailers have access to when selling Real Flame." Sell efficiently with a powerful, elegant app. 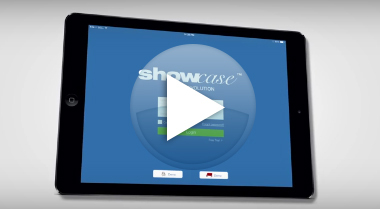 Learn about Showcase's great features and how to make them work for you! For more videos and tutorials, please visit our tutorial section. We who we are and want to help you conquer the trade show floor. Close those deals with Showcase today!